On Saturday, June 6, Stacy and I attended the Hoosier Hills Fiber Festival (website) in Franklin, Indiana. This is a two-day festival, held on Friday and Saturday, but we were only able to make it for the Saturday since we were at Greencastle, Indiana’s First Fridays program on Friday afternoon and evening. We had a wonderful time at the Fiber Festival, and had plenty of time to visit all the vendors. We did not have enough time to take any of the classes at the festival; if we were able to go both days, we would have taken at least one class. 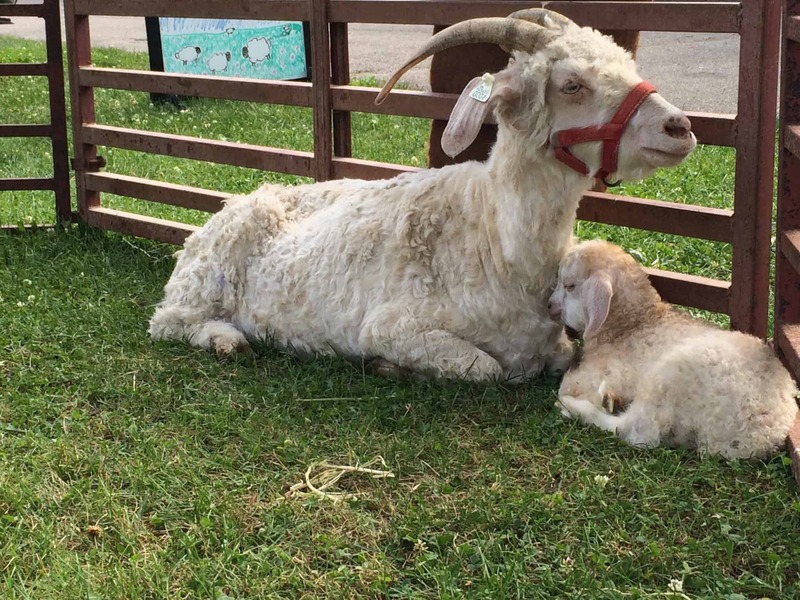 I love going to fiber events held at county fairgrounds or similar outdoor venues because animals are always present at these events. Hoosier Hills is such an event. When we drove through the gate of the fairgrounds, we saw the alpaca and llama pen on our left. It was the first place we visited. This area was organized by a local 4H chapter. 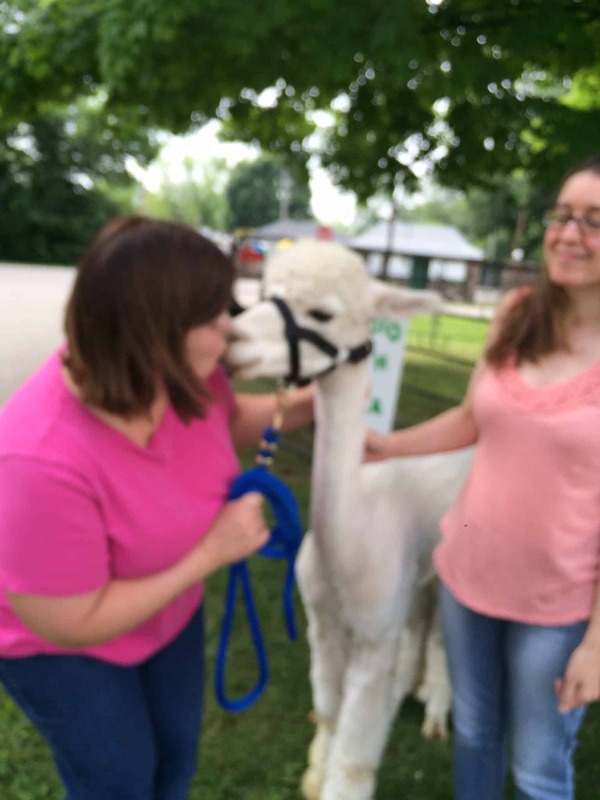 They set up the lawn area as an obstacle course and at three times during the day, the 4H members led their alpaca or llama through the course. My favorite obstacle was the hula hoop. The child held the hoop up and the alpaca jumped through it! 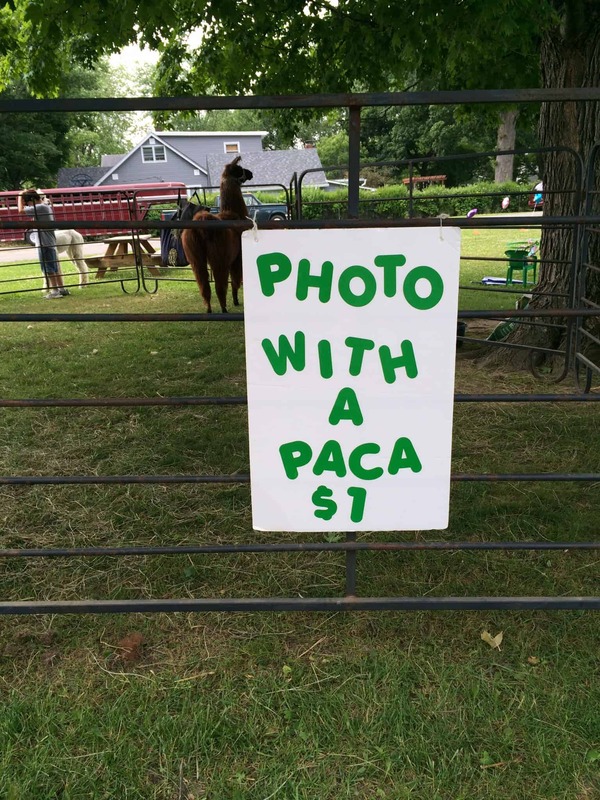 The 4H was raising money by taking pictures of Festival attendees with an alpaca. 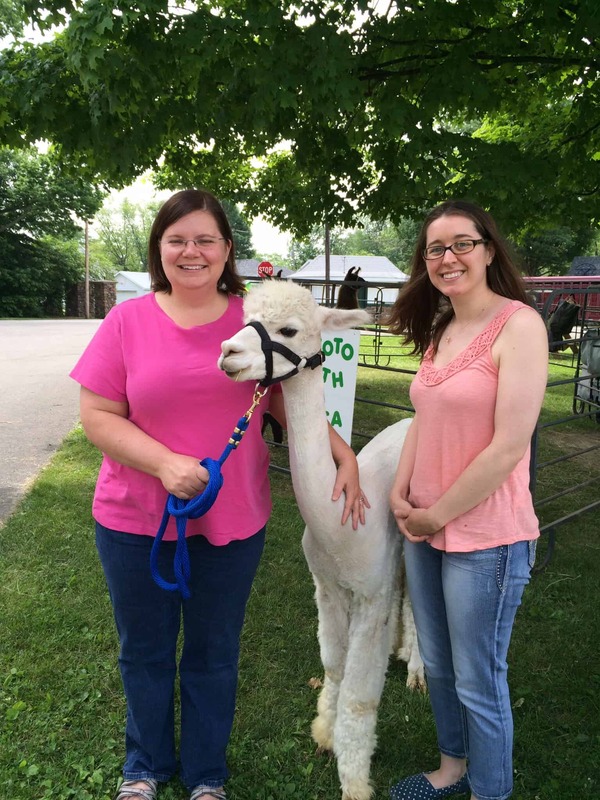 Of course, Stacy and I had our picture taken with an alpaca! This one is named Hapi (pronounced happy). He’s about a year old and a rescue. When his owner rescued him, he was quite nervous around people but now he’s super friendly. If you look closely, you might be able to see the little piece of straw sticking out of his mouth. Hapi’s owner told us he gives kisses. I’m sad this picture is out of focus, but it is still funny! 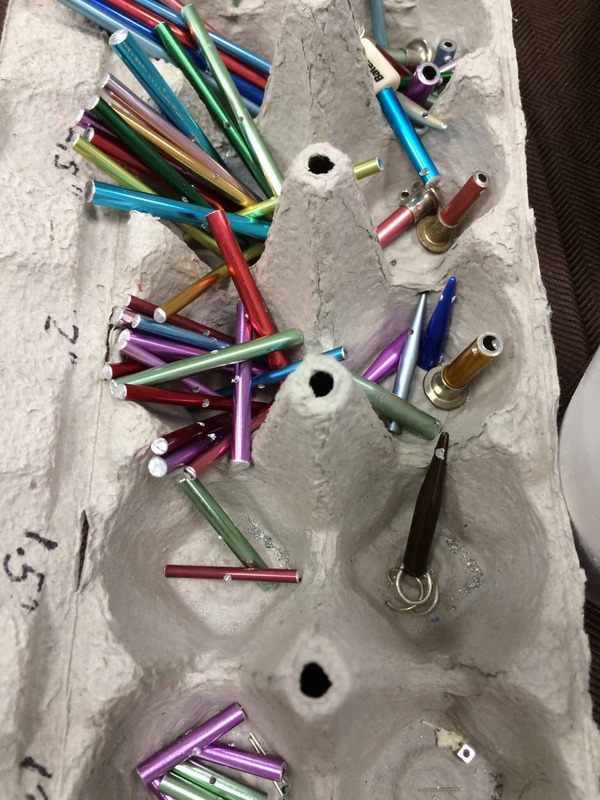 On the opposite side of the lawn area was a pen containing a one-week-old kid and his mama. This little goat was hilarious. He came running over any time I bent down to take a picture, but didn’t want to be petted. He needed to check out everything in the pen and he was the boss of everything. 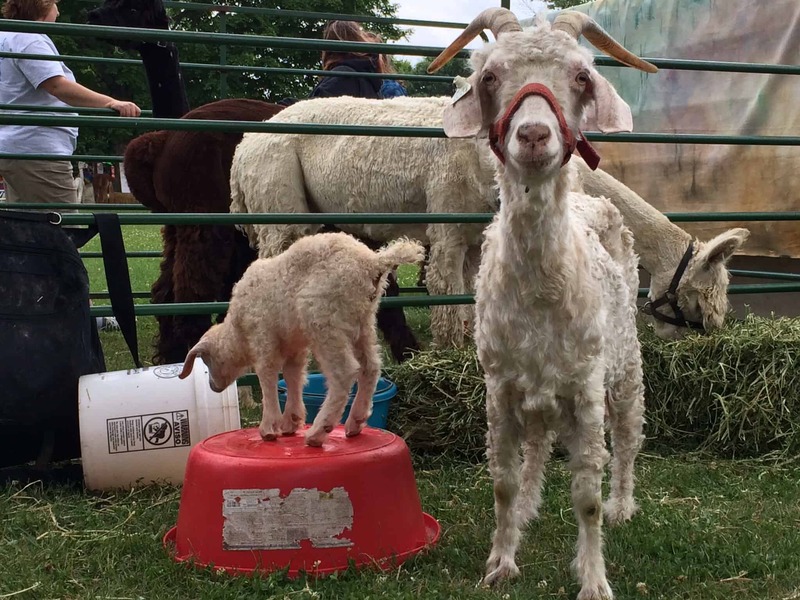 When a llama in an adjacent pen stuck its head through the bars and started eating the straw in the goat pen, the baby ran over and jumped on top of the bale, like he was the king of the pen! I didn’t get any pictures of the food, but did want to comment on the available food. I only saw two food trucks: ice cream and kettle corn. This is the kind of food I expect at events like this, and assumed we would have to leave the fairgrounds to find a restaurant in town for lunch. But then we went into one of the vendor buildings and discovered that the 4H was selling food. They had burgers, hot dogs, chips, and bottled drinks. And they had vegan vegetable soup. I was so thrilled! I’m a lacto-ovo vegetarian and fairs tend to be hard re: food. I expect to eat snack food like kettle corn at worst and unhealthy food like greasy pizza at best. Every once in a while, I’ll stumble on to something really worth eating like grilled corn or the various offerings of the Artichoke booth at Maryland Sheep and Wool. I’ve never found vegan vegetable soup at a fair before! It was delicious. It looked like it was homemade, and was full of vegetables like potatoes, carrots, lima beans, peas, and more, all for only $2 for a cup! Just over 50 vendors attended this festival. Perhaps 1/3 of these vendors also attend The Fiber Event in Greencastle, which takes place two weeks before Hoosier Hills. The rest were vendors we hadn’t seen before. I had three goals for shopping at this event: Good for Ewe Mirrorball yarn (this is a yarn manufactured in Indiana, which I bought from Nomad Yarns (website, Ravelry group) at last year’s Fiber Event) so I can reknit the Begonia Swirl Shawl that got felted, yarn to knit a shawl for Stacy, and maybe some breed-specific spinning fiber if I happened across any I don’t already have. I did purchase these things and then some! I picked up twelve 1/2 pound (800 yard) cones of Maysville carpet warp (Affiliate link to The Woolery) from Couch’s Little Workshop. I only bought three other skeins of yarn. 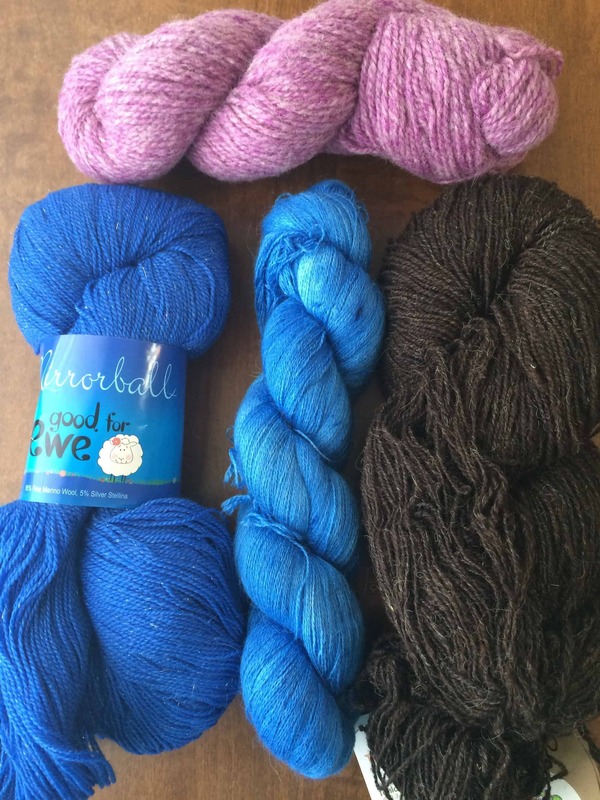 The blue skein on the left is the Good for Ewe Mirrorball I needed for my replacement Begonia Swirl Shawl, which I purchased from The Clay Purl booth. The blue skein in the middle is from Knitted to a T. It is laceweight Opulent (70/20/10 Baby Alpaca / Silk / Cashmere) in the Sapphire colorway. At 1312 yards for 104 grams, it’s a very fine weight of lace yarn! This is the yarn for Stacy’s shawl. 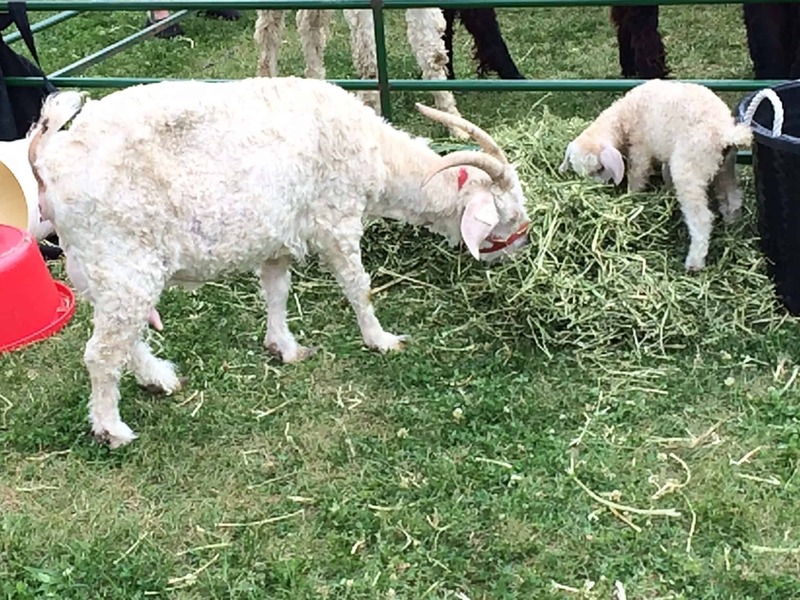 The brown skein on the right is from Ballyhoo Farm in Kentucky. It is undyed Shetland wool from “Cake.” I love yarn where you know the name of the sheep who grew the wool! The fourth skein, the pink one, was a door prize. It is a skein of Bartlett Yarn, provided by Copper Centaur Studios (website, Facebook). I rarely win anything, so was excited to get a door prize! 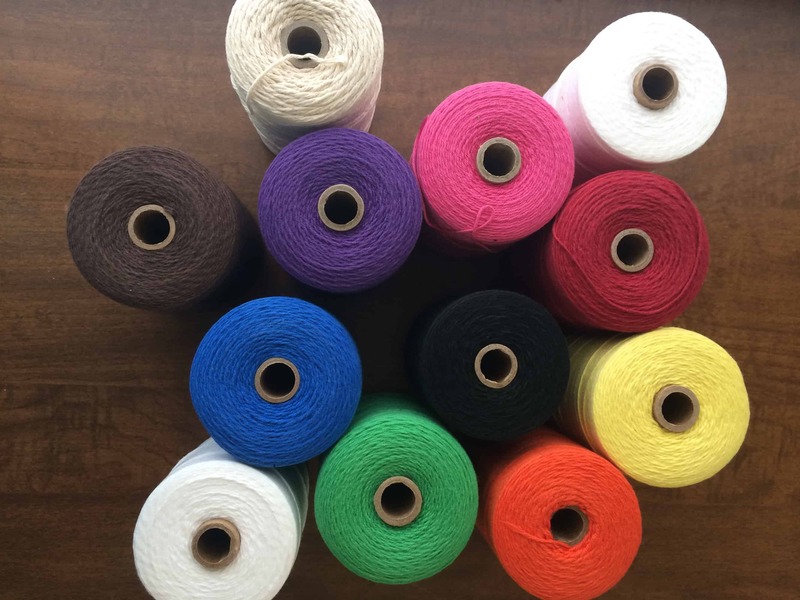 I didn’t know until I was writing this blog post that Bartlett Yarns is a family-owned mill in Maine that’s been around since 1821. That’s pretty cool! 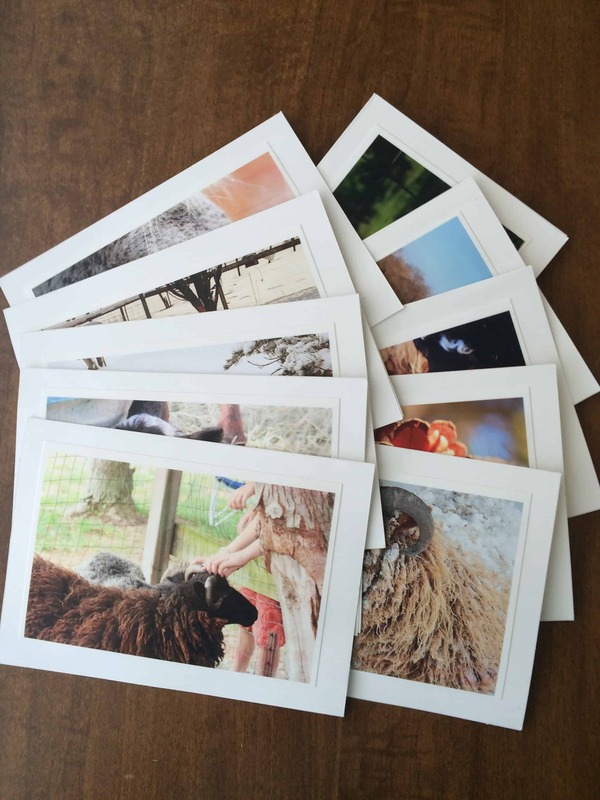 I got these notecards from Ballyhoo Farms. All the photos are from their farm. I got to sort through a stack of cards to pick 10 for my set, and it was truly hard to pick! The one on top is Cake, the producer of the wool that became my skein of yarn. I was about to order some more Knit Picks cables, so was glad to run into a booth selling them. Now I won’t convince myself to spend $50 at Knit Picks, so that I can get the free shipping. I got the Wacky Woollies umbrella and the two buttons at the same booth as the cables. I bought the two shawl pins at The Clay Purl booth when I bought the Mirrorball yarn. They are handmade by Lisa Thyr of Wool’s End. Her business card doesn’t have a website and I couldn’t find her on Google Search, Etsy, Ravelry, or Facebook. 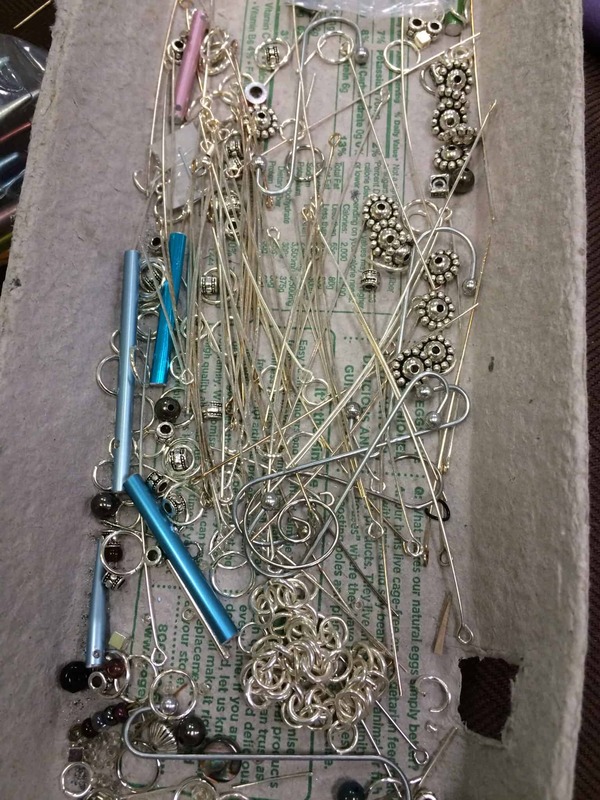 Her work is beautiful and I had a hard time picking just one or two shawl pins! 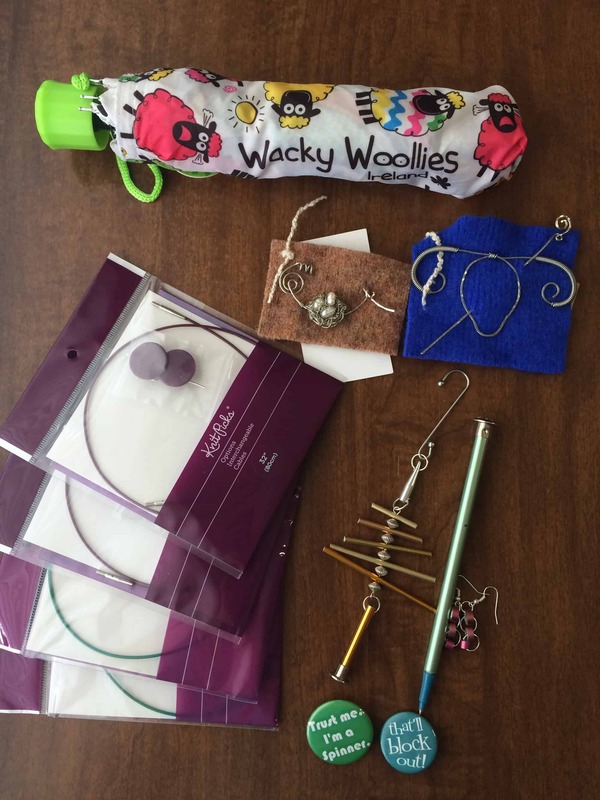 The three remaining items on the right hand side of the photo — the Christmas ornament, pen, and earrings — are all from Bur Oak Studio (website, Facebook, Etsy). The artist is Jennifer. 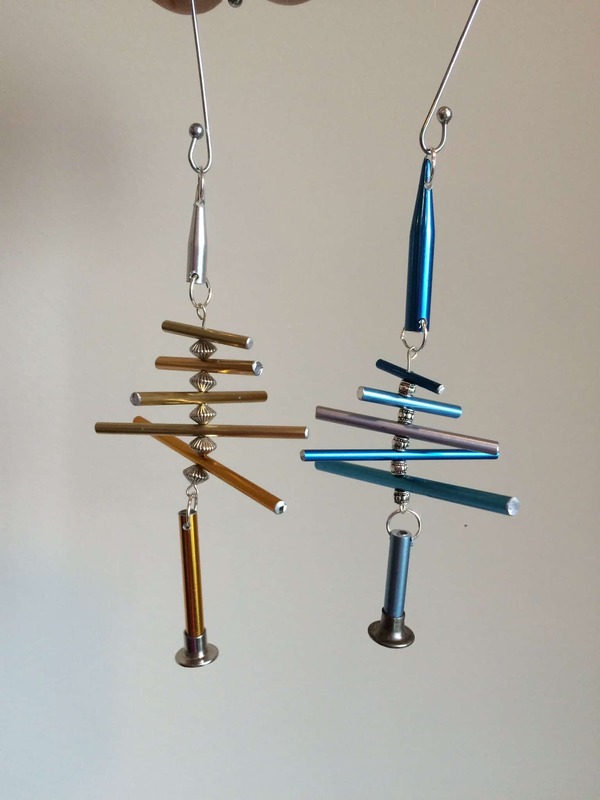 She makes all kinds of beautiful items from metal knitting needles. She has signs for identifying plants, bracelets, necklaces, magnets, bookmarks, and more. Stacy bought me the pen as a gift; I bought her a Christmas ornament as a gift. 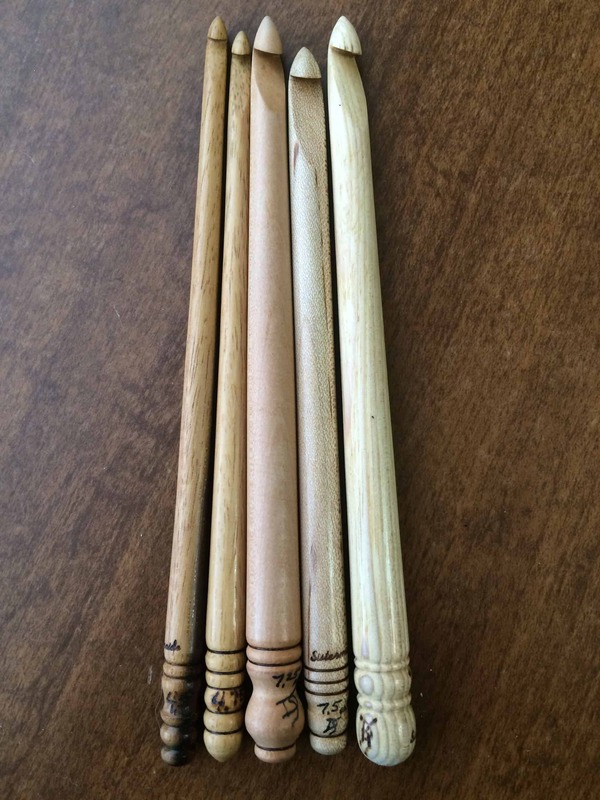 At The Fiber Event last year, I bought 4 hand-turned crochet hooks from Sistermaide. This year, I bought 5 more. I love these hooks. They are well made and pointy, which I find helpful since I still crochet very tightly. 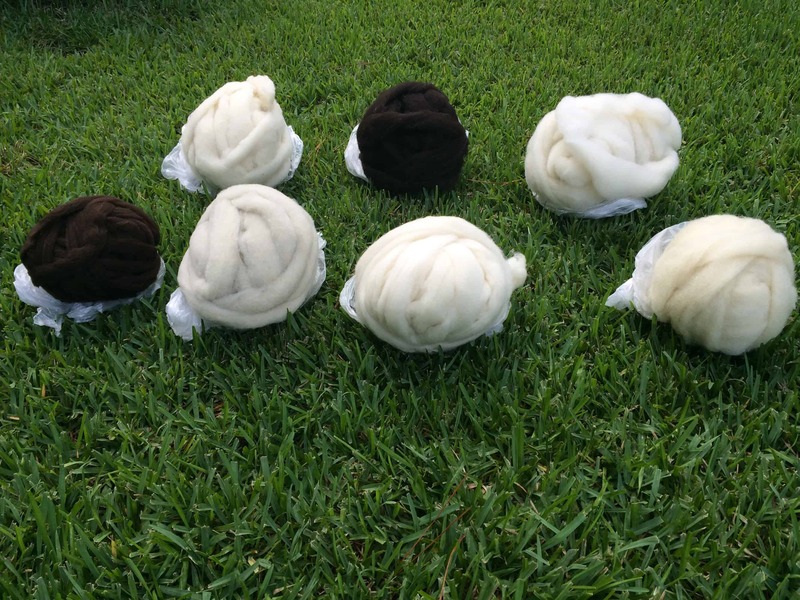 I bought 7 new-to-me breed-specific fibers from Dyed in the Wool. Sandy and Benita (host of The Fiber Pusher Podcast (website, YouTube, Ravelry Group)) are incredibly organized. They had many different kinds of fiber (at least 50), and the best way to buy it that I’ve ever seen. I wish I’d taken a picture of the set up. They had a couple of poster boards with rectangles drawn on them with a sharpie. Each space on the board was for a different kind of fiber. The name and inventory number of the fiber was at the top of the space. The price per ounce was on the bottom of the square. In the middle of the box, they attached two samples of each fiber, one unspun and one spun. When they sold out of a fiber, they taped a piece of paper marked “out of stock” over the space. Inside the booth, the big bags of roving and top were arranged by inventory number. I took some time looking at the board, then read off all 7 inventory numbers for the fiber I wanted. Benita went into the booth and weighed out the 4 ounces of each fiber, as I specified. Each fiber went into its own grocery-style bag and Benita wrote the fiber name and weight on the outside of the bag. She wrote all the bags first, before she started weighing, and passed the list of fiber to Sandy so I could pay while Benita was weighing. Stacy and I were joking that it looked like I was carrying around a miniature flock of sheep, so I took this picture of the flock out in the grass. I had to leave them in the bags, though. It’s summer in Central Florida, which means it rains for an hour or two every afternoon. It seems as though the grass is never dry! A few of the fibers I bought were single-animal. The name in quotes after a breed name is the name of the sheep! LincolnFolk is a breed I hadn’t heard of before. It is in development by Richert Ranch, crossing their Suffolk x Hampshires with Lincoln. 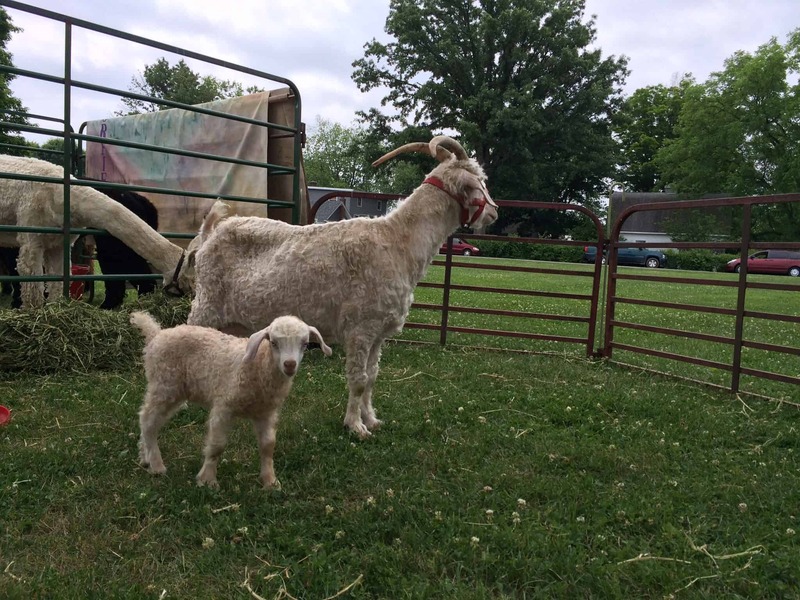 On her blog, Benita has a post about visiting the farm to buy fleeces. 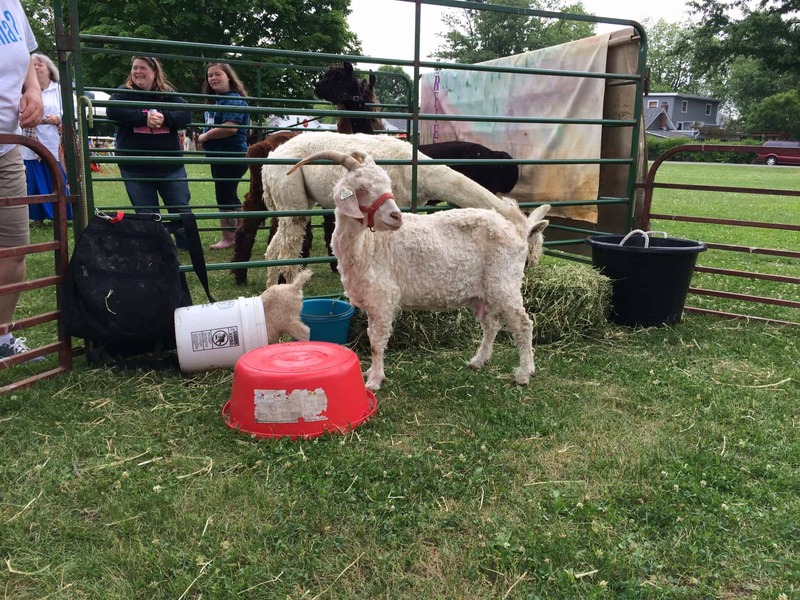 That blog post includes a picture of raw fleeces from Marshmallow Jr., Poppy, and Gavroche. Marshmallow Jr is the second raw fleece you’ll see as you scroll down the post. Poppy is in the middle, the last of the black fleeces pictured. 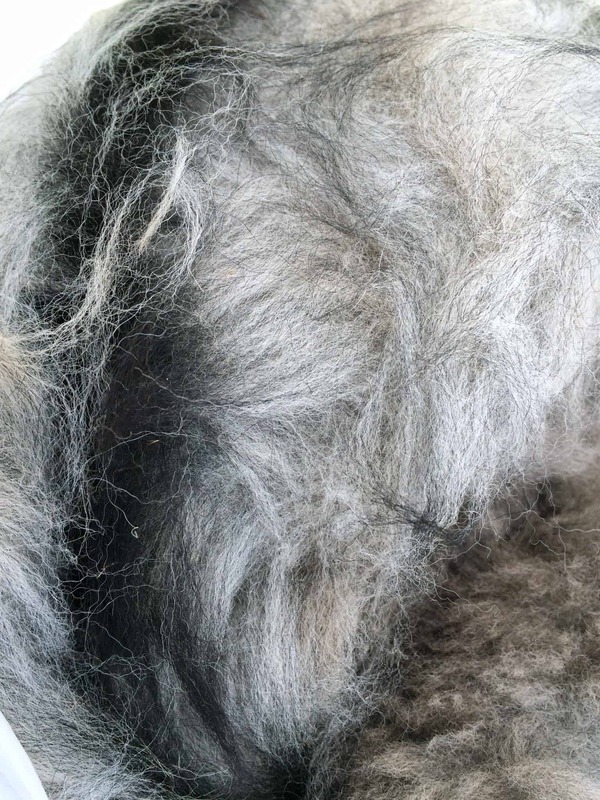 The very last fleece pictured on the blog post is Gavroche. I don’t know if any of the pictured fleeces are the source of the fiber I purchased, but it’s fun to see raw fleeces from the same sheep! I recently finished spinning Cotton Candy Corriedale dyed by Sassy Bee Fibers (website, Facebook). I bought that fiber at The Fiber Event last year; this year, I bought three fibers from Sassy Bee. from top to bottom: Corriedale, Nylon, Tencel blend in Poseidon (3.8 ounces); Merino, Inego silk, Mohair lock blend in Aquaman (4.0 ounces); Corriedale, Bombyx Silk, and Nylon blend in Lotus (4.3 ounces). We thought we were done shopping for the day. On our way out of the fair, we stopped back at the competition table to see who won the various prizes. Many of the fleece entries were gone, either sold or picked up by whoever entered them. One of the remaining fleeces was a beautiful, black Alpaca. The woman at the competition booth told us the fleece was so stunning that the judge wanted to buy it! The person who entered the fleece did not plan to come back to pick it up. Her son was in a car accident; she dropped the fleece off at the festival and went straight to the hospital. As a result, we weren’t able to get much information about the fleece. Neither Stacy nor I wanted an entire Alpaca fleece, so we decided to split it. We bought the fleece, and I carried it over to the Ohio Valley Natural Fibers booth and dropped it off for processing. Before I dropped it off, I took a quick picture, but this really doesn’t do the fleece justice! I can’t wait to get the roving back from the mill, but it will take a while. Their current processing time is about 3 months. 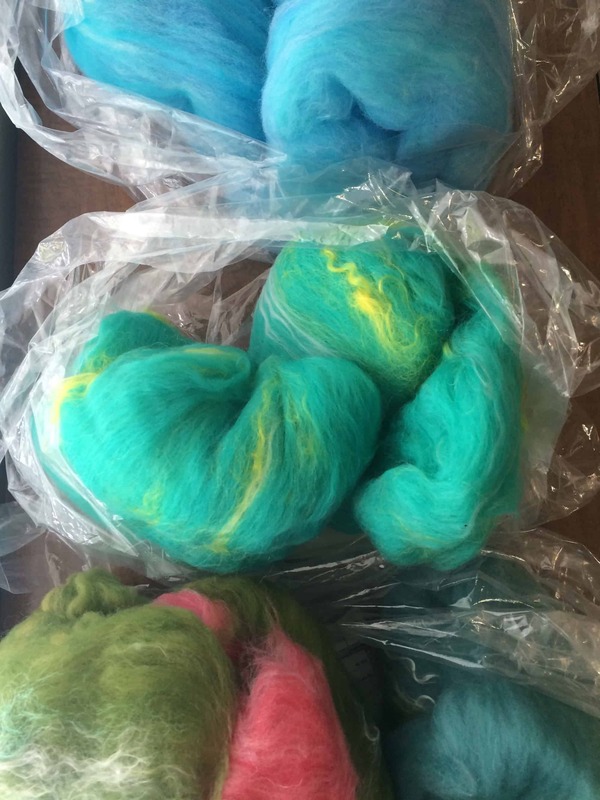 Thank you so very much for your lovely write-up about Hoosier Hills Fiber Festival and the Dyed in the Wool booth. I look forward to seeing what you make from the fiber you purchased from us.